Cross-posted from the ICT4Peace Foundation’s blog. I March this year, Patrick Meier wrote to me and to Daniel Stauffacher, the head of the ICT4Peace Foundation, to give input into what at the time was a draft note around creating a global network of civilian UAV pilots to support humanitarian efforts. The draft concept note was a compelling call to focus on what is already a growing practice of using UAVs for non-lethal purposes, ranging from post-disaster needs assessments to their use in development programmes. The stigma justifiably associated with and perception of UAVs as vehicles of lethal harm is rooted in, to date, their predominant real-world use as offensive machines of war, anchored to discourses on terrorism. The pre-dominant need for ethical frameworks to govern the use of UAVs in humanitarian domains and contexts, and a rights based approach to their introduction, including the information collected as a consequence of their operation. The need to differentiate (in terms of operational ceiling but also based on intent) UAV operations in humanitarian contexts with UAVs that provide Internet access, for example, as mooted by several companies to date. Working with existing groups and platforms like Crisis Mappers, OpenStreetMaps and Tomnod to see how UAV derived imagery could be used to crowdsource and expedite analysis. How higher frequency of image gathering along with better resolution, the greater possibility of community ownership of and access to UAV acquired information, far lower operational costs in comparison to satellite image acquisition and analysis, faster capture to delivery mechanisms and other factors position UAV imagery as that which can complement (not replace) traditional satellite imagery based analysis and responses around disasters. The need to proactively generate ideas and critically analyse use cases around UAV use in non-lethal contexts, so that best practices can be drawn up from their increasing use globally. Subsequent to this feedback and the launch of uaviators.org, the Foundation was invited by Patrick Meier to become one of the network’s founding advisors, comprised of some of the world’s leading thinkers, researchers and operators of UAVs in non-lethal domains. I’ve been for a while a daily consumer of content through FlipBoard. I first downloaded it on to my iPad Mini around 3 years ago and have since found it an indispensable app to keep up with the information and news I want to follow. 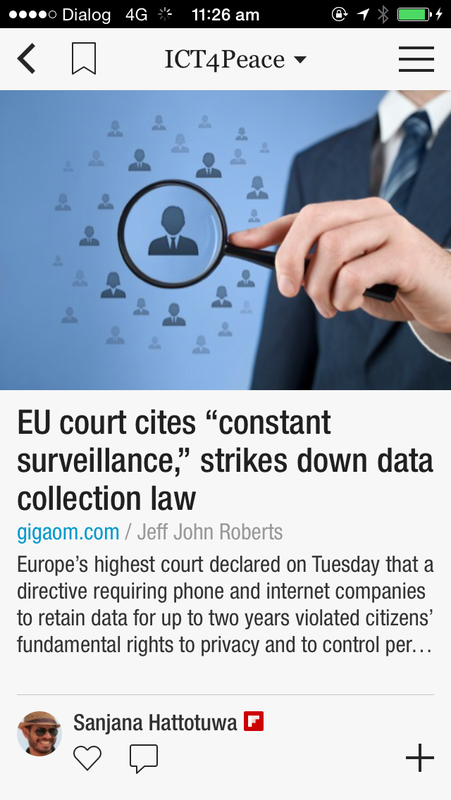 It helps that it’s also one of the best looking apps around for smartphones and tablets. Over time, the app allowed users to curate and publish, using the app, their own magazines. I launched the Groundviews FlipBoard magazine in 2013, which to date remains the only media related magazine published out of Sri Lanka on the platform. 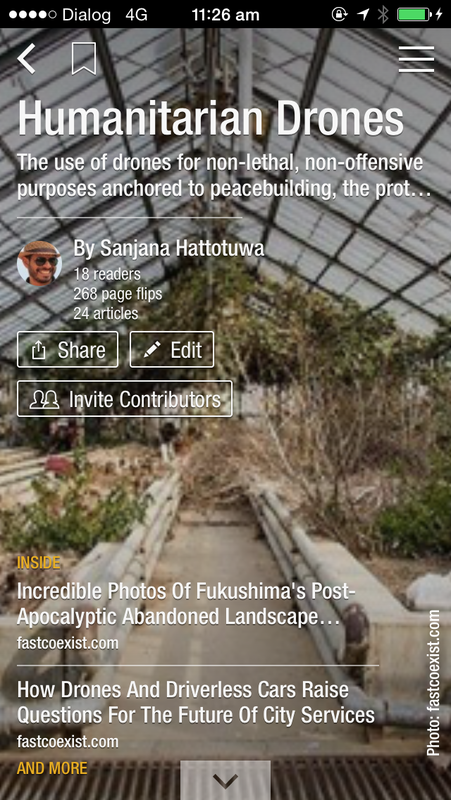 Also last year, I launched FlipBoard magazines around ICTs in peacebuilding and another on crisis mapping. 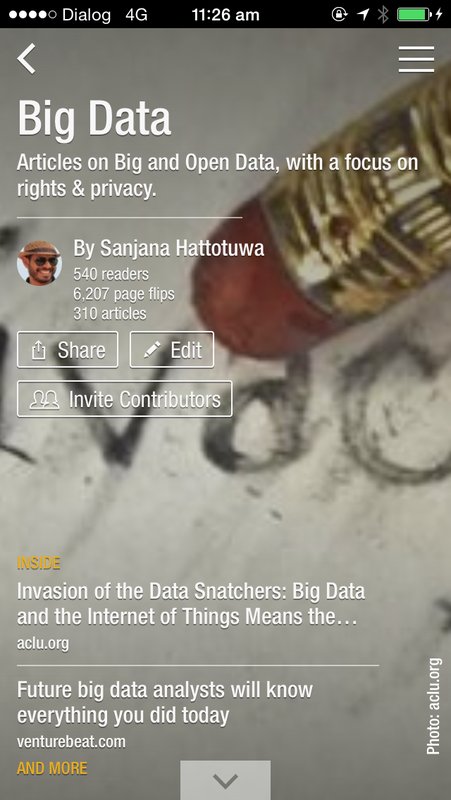 Leading up to the International Crisis Mappers Conference 2013 in Nairobi, Kenya (ICCM), I created and formally launched at the event a FlipBoard magazine around Big Data, with a specific focus on the humanitarian and peacebuilding domains. These three magazines I curate on behalf of the ICT4Peace Foundation. In March this year, I created and launched a FlipBoard magazine on the use of UAVs/drones in humanitarian relief and for non-lethal purposes. This also I curate on behalf of the ICT4Peace Foundation. There are close to 2,000 subscribers in total for these magazines, which is indicative of the reach of the FlipBoard apps across multiple mobile platforms (it started off only on iOS) and also the interest in consumers to get their information and news presented in a visually compelling format. FlipBoard’s bookmarklet makes it easy to add content from the web as I am browsing – though what’s hardest is to keep in mind each magazine’s focus as I quickly go through pages on the web. I’ve always been interested in the power of digital published, and design oriented platforms like FlipBoard (I’ve also toyed with OnSwipe some years ago) to take standard web fare to new audiences, and especially a younger demographic hooked to their mobile devices. While the metrics don’t allow me to ascertain whether those who read updates through FlipBoard on any of these magazines go on to visit the respective web post or web site, it is clear that using the app, consumers are making the choice to engage with web content in a particular way – perhaps because of the stylish presentation, perhaps because of the devices they use it on, perhaps because of the social sharing features now baked in, perhaps because they curate their own FlipBoard magazine, or perhaps because they just consume content differently. On the invitation of SciDev.net, I wrote earlier this year an article looking at Big Data from the perspective of someone who lives in a country post-war, but reeling from systemic conflict, human rights abuse and under an illiberal, authoritarian regime. 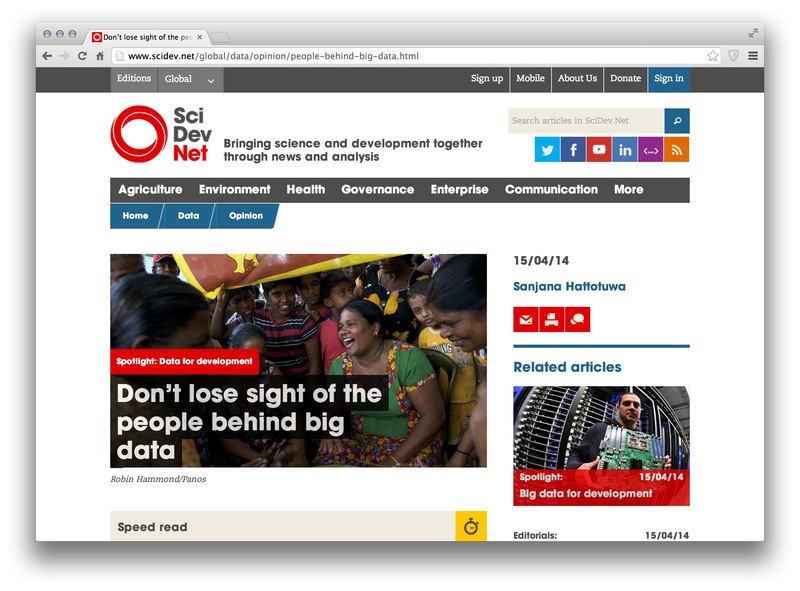 The article was published in April on SciDev.net’s site, as part of an excellent collection of writing on Big Data for development. “[there are challenges] for civil society in post-war Sri Lanka and similar settings: to convince fellow citizens that data in the public domain can strengthen democracy post-war — but also alert them to the fact that no matter how benevolent data systems seem, any platform that hordes information without meaningful accountability or oversight endangers peace and courts violent conflict. It’s been a while since I updated this blog – nearly a year in fact. My previous post, in early July 2013 was around a presentation I made on digital archives at an exhibition in Colombo. Coincidentally, I am now preparing for another public talk on digital archives (Capturing the Ephemeral: Archiving our digital present), towards the end of this month, at the American Centre in Colombo. 30 Years Ago: A first of its kind multimedia, web-based exploration of the anti-Tamil pogrom in Sri Lanka, in July 1983. The online curation led to a physical exhibition in Colombo at the Park Street Mews, Warehouse D (see photos here), and also some really interesting discussions with people who had lived through and experienced the pogrom, as well as those born long after it, and dealing with the enduring trauma it resulted in. I also did this interview with Vikalpa in Sinhala on why it was important to never forget Black July. Setting up a website in Sri Lanka to look into issues of web and Internet censorship, funded by Google. Internet Media Action was launched late last year, and is intended to serve as a platform that collects and disseminates information around best practices in keeping information and communications secure, threats to the freedom of expression online, the ways through which ISPs and government undermine privacy and consumer rights, examples of web censorship particularly in Sri Lanka, and other content related to the promotion of an open, free web. My submission at the launch of the network flagged how the Internet and web play an integral role in shaping post-war Sri Lanka’s democratic future. See photos here. In October 2013, I was a speaker at the inaugural Lasantha Wickrematunge Memorial Lecture, held in Toronto, Canada and organised by Sri Lankans Without Borders (SLWB). My submission was anchored to the post-war mainstream and web based media landscape in Sri Lanka, and how in addition to violent pushback from government and on-going attacks against journalists, the mainstream media itself was to blame for unprofessional, unethical and openly biased journalism. I was joined by Stewart Bell, a Senior Reporter at Canada’s National Post and was especially pleased to share the stage with J.S. Tissainayagam, the award-winning journalist-in-exile. I was the only Sri Lankan invited by Google to take part in the Google Ideas conference in New York, in partnership with the Council on Foreign Relations and Gen Next Foundation, titled Conflict in a Connected World. The Summit aimed to build awareness of how conflict is being transformed by today’s connection technologies. Through a series of panels, presentations, and your participation in one of a number of labs, Google hoped to expose current online threats, contemplate future trends, and bring attention to tools and approaches designed to empower people in the face of conflict or repression. I participated in an off-the-record breakout lab on Activists and Cyber-security, with other leading technology providers and activists from Asia. In late October and early November, I was in Berlin, co-teaching a training programme on Crisis Information Management with the Center for International Peace Operations, based in Berlin. I focussed on OS-INT (open source intelligence) and new media, including source verification and neo-cartography. I also conducted a session on digital and web security. Photos here and a description of the training programme can be read here. I conceptualised and moderated a panel discussion on Big Data at the International Crisis Mappers Conference (ICCM), held for the first time in Nairobi, Kenya. The video of the panel is now online, and an overview of what was discussion can be read here. Speakers included the distinguished Jon Gosier (D8A Group), Anahi Iayala Iaccuci (Internews) and Emmanuel Letouzé (University of California-Berkeley). I was also live tweeting from the event – see Day 1 and Day 2. During ICCM 2013, I also gave a presentation on innovation using ICTs, particularly as it related to practices in the humanitarian domain. I also spoke with the GSM Association (GSMA) around an idea that could help victims in a sudden onset disaster send SOS requests out without any direct action on their part. Though not directly related to my work on ICT4Peace, I launched a book of very short stories, anchored to Sri Lanka, titled ‘Short & Sweet‘. Almost two years in the making, the book was widely acclaimed as a refreshingly different and interesting take on Sri Lanka’s violent histories. In early March 2014, I led the conceptualisation, design and delivery of a new ENTRi course on the use of new media for crisis management. The training was conducted in collaboration with the renowned Zentrum für Internationale Friedenseinsätze gGmbH / Centre for International Peace Operations (ZIF), based in Berlin, and introduced participants to a variety of new media tools and platforms used in the collection, presentation, verification, and dissemination of information. Particularly exciting, personally speaking, was to see Cedric Vidonne from UNHCR, Rina Tsubaki from the European Journalism Centre which recently published the acclaimed Verification Handbook and Eoghan Mac Suibhne, from the world renowned social media verification agency Storyful, also participate in the training as guest lecturers. I penned a report of the programme here, and there’s lots of photos of it here. Also in March, I delivered a presentation and participated in a Q&A session with the Crisis Management Centre (KMZ) of the Swiss Ministry of Foreign Affairs on big data and social media’s role and relevance in crisis management, with a special focus on emergency and crisis response from a governmental perspective. Again in the same month, I met with the Peace Mission Support and Rapid Response Section and the Methodology, Education and Training Section at the UN Office of the High Commissioner for Human Rights around the need to embrace new media and ICTs to strengthen High Commissioner’s mandate. It’s really great to see OHCHR embracing ICTs at the HQ and field mission levels to strengthen their mandate, but what I focus on is more the field level secure comms needs and challenges, and not so much the institutional IT investments around database harmonisation and business intelligence platforms. I have been asked however to give input into these investments over the course of this year, so that they are in line with challenges from the field and technology advancements that, particularly in a post-Snowden world, help secure communications better. Some of the work above merits longer blog posts, which I hope to pen in the days and weeks ahead. I also hope to keep this blog a bit more updated, despite a workload that shows no signs of easing up. Generate interest of people in Colombo/ Sri Lanka to explore these tools and use them for change. I am never convinced of the civic consciousness of Sri Lankan audiences, especially when you call upon them to bear witness to, as best they can and as much as they can, structures and forms of violence, or even just examples of good governance. Nature, colours, scenery, wildlife, still-life and portraits for example remain the domains most photography in Sri Lanka reflects, sans any real connection to or interest in framing more contentious, marginalised yet critical facets of peoples, society and life beyond. This was acknowledged by a photography teacher of over 20 years present in the audience, who said that creating this bond between society and photography was both vital, yet exceedingly difficult. I guessed the audience to be in their mid to early 20s, a time ripe for activism and mobilisation. Sadly, the largely enervated response to my own presentation, and the excellent points made by blogger and friend Dinidu de Alwis – who unlike myself, is actually a professional photographer – suggested to us both that this was not an audience who would risk a shot that endangered their precious equipment. Though understandable (professional grade body, lens and other equipment costs are astronomical in Sri Lanka, leave aside insurance) therein lies the rub, for without a drive to bear witness, having the best equipment dangling over hip or shoulder is more fashion accessory than tool for social change. Sri Lanka needs more look at this! photos instead of look at me! photographers. In my submission, I traced the origins of bearing witness to social upheaval, from painting to the birth of photography. I noted that in painting historical events, much like the colour of dinosaurs, the final product on canvas did not in fact depict any real ground truth, and was often a product of many narratives, including fiction, often spun or recalled by the victors, if it was a revolution or war depicted. The primary distinction with photography was that though framed and partial, a photograph (we didn’t get into the ethics of airbrushing or digital image manipulation) did in fact depict truer colours, and with greater immediacy and veracity, events and people who weren’t always part of the winning narrative. I showed some iconic paintings of the French revolution and the American civil war, plus one of Goya’s masterpieces on the Peninsular War, and compared these with equally iconic and moving images from this year’s uprisings in the Middle East. I then briefly looked at what’s changed in the economics of creation, the technologies used and the manner in which images were produced and disseminated. I then posed the question, for open discussion, as to whether professional photography (e.g. war photographers) were, no pun intended, a dying breed. Flagging the courage, conviction and work of Chris Hondros, a photographer from Getty killed in Libya, I asked whether the paradigm of bearing witness through photography had now shifted radically to citizens, and within that group, activists in particular. Anchored to a quote by the American photographer Chase Jarvis, I looked at the evolution of mobile phone based photography, and the fact that the most popular ‘camera’ on Flickr is actually the iPhone 4. Through the next series of slides I explored what this confluence of professional photography and activist photography via mobiles and other point-and-shoot cameras meant for activism. I used the example of the horrific first images of Menik Farm, Vikalpa’s photojournalism in capturing political activism, the compelling high definition productions by the photographers involved in the Moving Images initiative, the compelling use of photography to communicate poverty research in Sri Lanka, TED Prize winner JR‘s use of photography for social and political activism and the use of Twitter in the dissemination of in situ photography. I then touched on how in a post-PC world, mobiles and tablets were re-shaping, radically, the way photos were taken, manipulated, disseminated and consumed. The day before the presentation, I coincidentally had a great Twitter conversation with senior journalist and professional news photographer Amantha Perera. The title for this blog post comes from one of my responses to him. In my presentation I went on to show how young people, for little money, using off the shelf equipment and standard point and shoot cameras, were changing the way we saw the world, and changing how their immediate neighbours and communities engaged with their environment. I talked about the challenge of curation and sense-making when there’s a ton of photographs to sift through, and finally how tools like Microsoft Photosynth can change the way we see and engage with the world. I ended on a non-technical note. 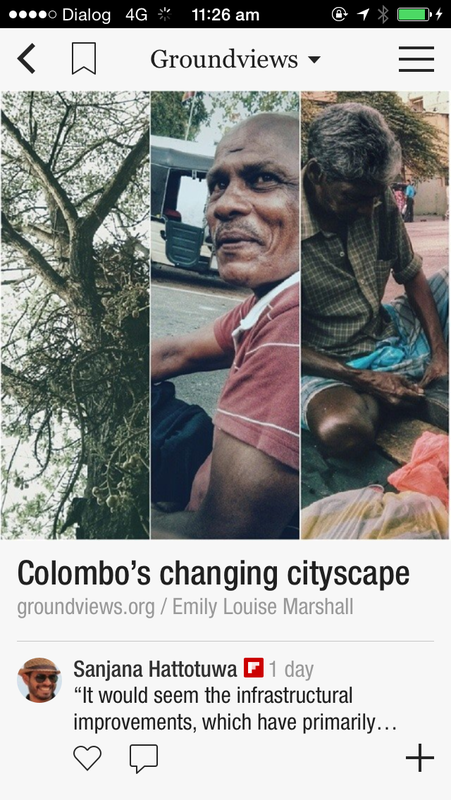 Showcasing the iPhone app of Groundviews, I said, not without some vexation, that the greatest challenge to activism today, in Sri Lanka and many other places, was not so much the technology to bear witness, but the willingness of citizens to do so. Without that spark, that inner calling to stand up for what is right not because it is a fad, popular or because of fame, no D-SLR, smartphone or even the amazing Lytro will result in the kind of social, cultural and political reform this country so desperately needs, post-war.